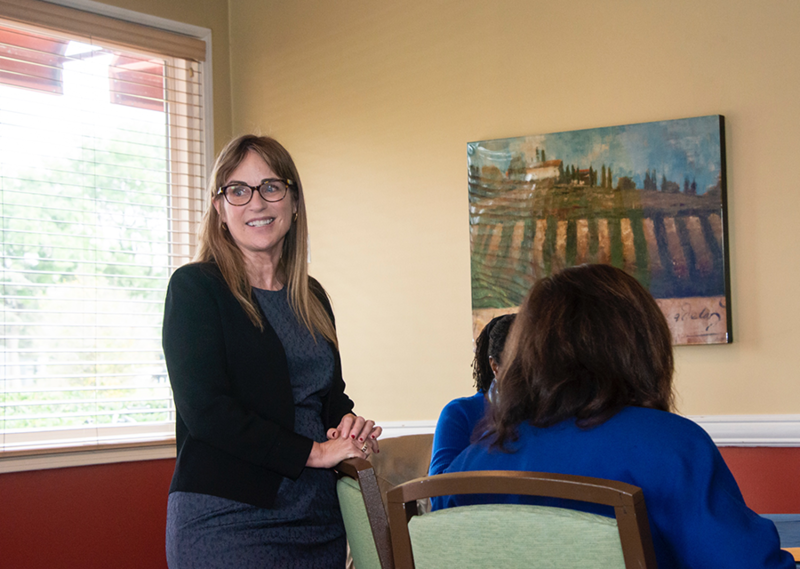 Joni Campanella-Roan, daughter of Roy and Roxie Campanella, speaks about the importance of physical therapy at the Campanella/Dodgers Scholarship Luncheon at the Orange Grove Bistro, in February 2019. Photo by David J. Hawkins. 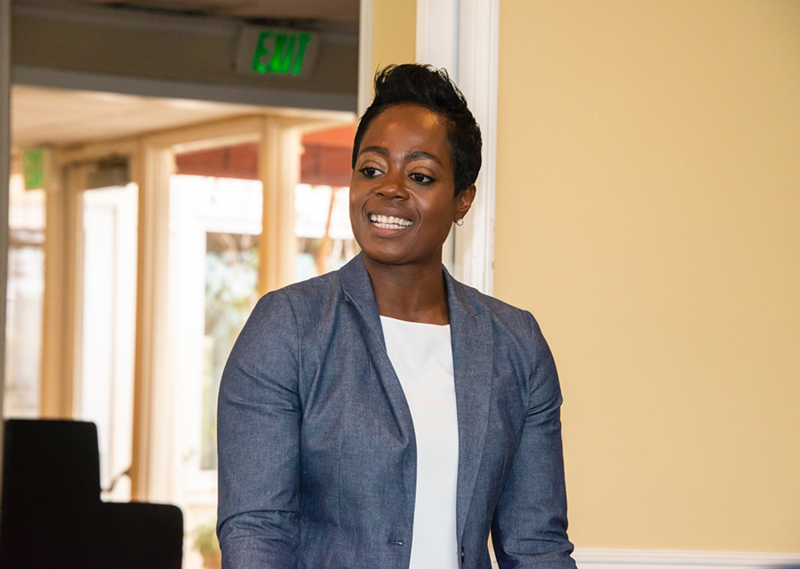 LA Dodgers Foundation executive director Nichol Whiteman congratulates the scholars at the Campanella/Dodgers Scholarship Luncheon at the Orange Grove Bistro, in February 2019. Photo by David J. Hawkins. 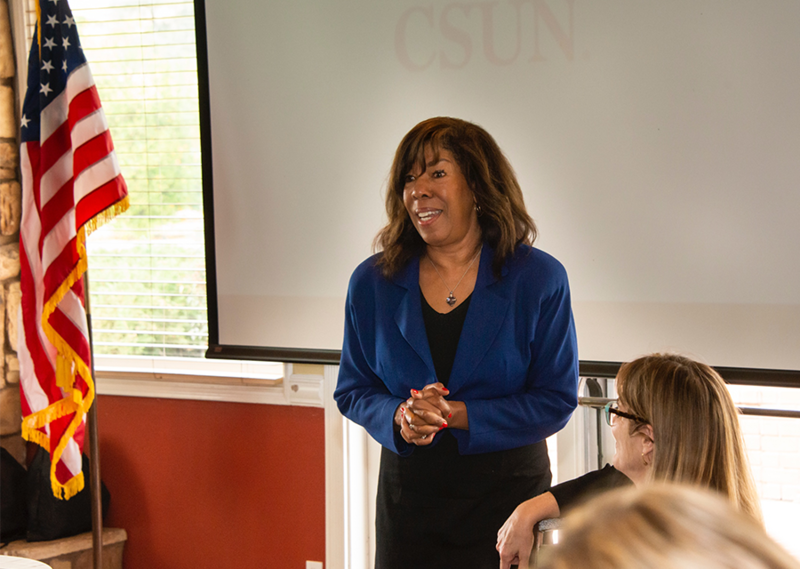 Janna Beling, chair of the Physical Therapy department, welcomes the scholars and the representatives of the Campanella and Dodgers Foundations to the Campanella/Dodgers Scholarship Luncheon at the Orange Grove Bistro, in February 2019. Photo by David J. Hawkins. Joni Campanella-Roan, representing the Campanella Foundation (far left); Nichol Whiteman, executive director of the LA Dodgers Foundation; Farrell Webb, dean of the College of Health and Human Development; Janna Beling, chair of the Physical Therapy Department; Aimee Kachingwe, physical therapy professor; and John Pepitone, CSUN director of development gather with the ten Campanella/Dodgers Scholarship recipients outside the Orange Grove Bistro in February 2019. Photo by David J. Hawkins. 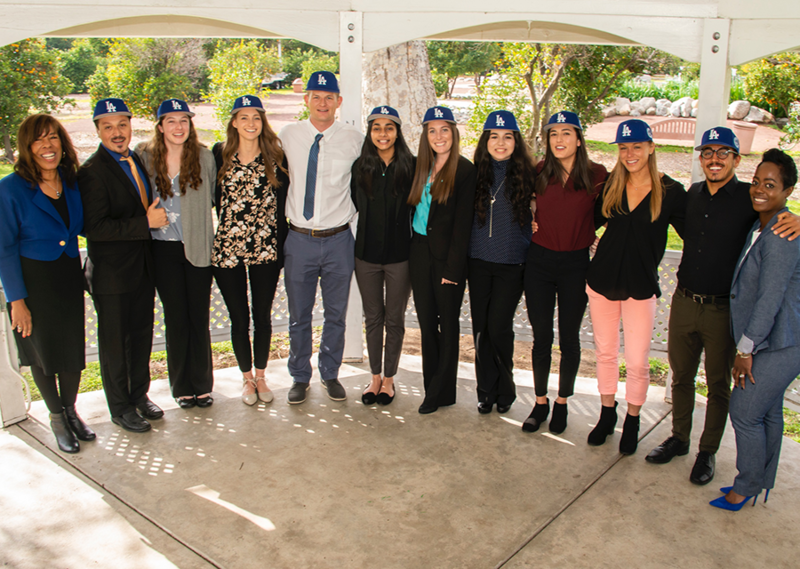 The ten Campanella/Dodgers Scholarship recipients, all wearing their Dodgers hats, pose for a photo with Joni Campanella-Roan, daughter of Roy and Roxie Campanella, and LA Dodgers Foundation executive director Nichol Whiteman outside the Orange Grove Bistro in February 2019. Photo by David J. Hawkins. Coolly fixing his hair as he went up to claim his award and get his photo taken at the Campanella/Dodgers Scholarship Luncheon, physical therapy student Jose Perez didn’t look like he had gone to great lengths to attain this remarkable achievement, when in fact the opposite couldn’t be truer. Being the first college graduate from a family that originated from what he called some of the poorest parts of Mexico, fighting financial struggles day by day, Perez has known the meaning of hard work all his life. At age 12, he already started working to help support his family. Perez committed himself to become a physical therapist after he began to observe the lack of proper healthcare within the Mexican American community. When members of this community were injured, they weren’t properly treated or brought into physical therapy, he said, they were simply prescribed pills and given nothing more. Throughout his undergraduate years, Perez diligently trudged through rent and tuition costs amidst his burning effort to earn his degree. Getting through all this, he said, was due largely to the constant encouragement of his supportive family who urged him to stay the course. As he shared his story with all the attendees of the luncheon, he smiled brightly at the thought of finally earning a scholarship that would alleviate a great deal of his financial burden, helping him focus on getting the education he finds integral to the pursuit of his dream to serve the community. 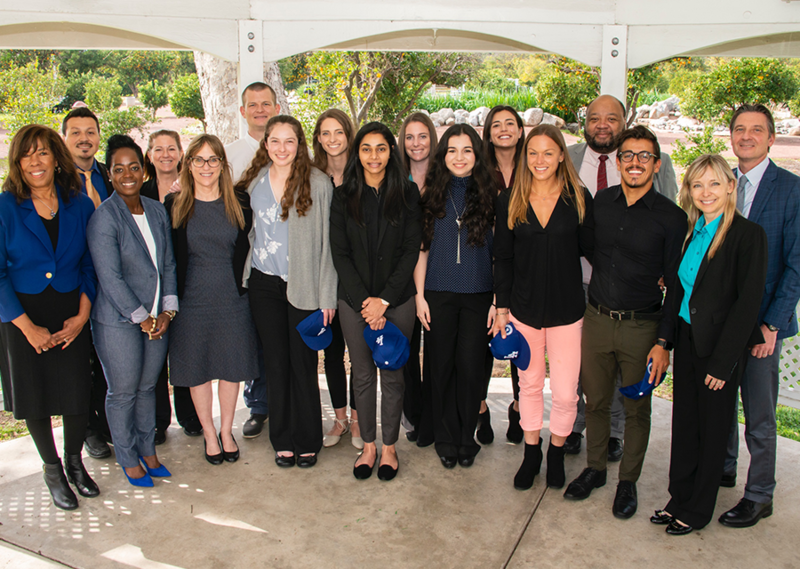 On Friday, Feb. 1, representatives of the California State University, Northridge College of Health and Human Development, the Physical Therapy Department, the Roy and Roxie Campanella Foundation and Los Angeles Dodgers Foundation all welcomed the Campanella/Dodgers Scholarship recipients for the academic year 2018-19 to a special luncheon in the Lambs Room at the Orange Grove Bistro. Perez was one of 10 scholars this year, each with heartfelt stories of overcoming personal and financial hardships as they pursue their doctor of physical therapy (DPT) degrees, and each receiving an individual award three times the amount of previous years’ grants. The Campanella/Dodgers Scholarship was a result of the partnership between the Campanella and Dodgers foundations that began in 2010. The scholarship grants students a monetary award to cover academic costs and places them in a unique opportunity to participate in community service events involving physical activity alongside players of the LA Dodgers. “Today, we’re celebrating philanthropy, altruism, doing good things for other people, and it’s really important to recognize the benefit of supporting these students who are going to do good things for other people,” said Janna Beling, chair of the Physical Therapy Department. “The scholarship award benefits students who have a very outstanding clinical potential, and they’ve been selected by faculty and clinical instructors based on their personal experience, community service, leadership abilities and academic standing,” Beling said. Representing the Campanella Foundation at the event was Joni Campanella-Roan, the daughter of Roy and Roxie Campanella. Six decades ago, when baseball Hall of Famer Roy “Campy” Campanella faced a tragic car crash that left him paralyzed from the neck down, ending the legendary career that paved the way for many more athletes of color to enter the Major League of Baseball, he thought his life was over. However, after his wife Roxie Campanella successfully encouraged him to seek help from a physical therapist, he saw how he could keep on living. For all that physical therapy has done for Campy, the Roy and Roxie Campanella Foundation was established in 1994 with the commitment to aid Doctor of Physical Therapy (DPT) students through scholarships and other programs. Each of the scholarship recipients shared what the opportunity meant to them, speaking about their sparked passions in physical therapy and their backgrounds of financial struggle. The scholarship, as every recipient said in gratitude, alleviates much of that burden and allows them to focus on their education. The recipients for the Campanella/Dodgers Scholarship for academic year 2018-19 are third-year DPT students Tara O’Rourke, Jose Perez, Ashley Surak, Kaylie Fisher and Kristen Hubbs; second-years Shayan Safar and Manvir Kaur; and first-years LisaMarie Ornelas, Reid Gatney and Daniella Averbukh. “Resilience is the word for today,” said LA Dodgers Foundation Executive Director Nichole Whiteman, commending the scholars for getting through their hardships like Roy Campanella himself. California State University, Northridge DPT students have benefitted from the generosity of the Campanella Foundation for more than 20 years. Under the College of Health and Human Development, the DPT Professional Degree program is a three-year doctorate program accredited by the Commission on Accreditation in Physical Therapy Education that sets students on the path to becoming a practitioner in the field of physical rehabilitation. Fall 2020 applications to the DPT program will be open from July 2 to Oct. 1, 2019.